Use our Timing software to control devices using solenoids and relays. Also suitable for lights, drippers, aquaponics, pumps, bells, time clocks, sprinklers, water, hydroponics and irrigation or anything that needs to be turned On or Off. Download free, 30 day trial software. To control via the USB or serial ports, see Serial Timer and Serial Timer USB software below. Also we have our small computer board WiFi Time Control, with added Timer software for Web based communications. Please contact us if you would like to try our demo. Take a look at the screenshots for the 7 available timing programs below. Discover the most suitable program for your needs by clicking the More info button. And lastly, download the free 30 day trial version. 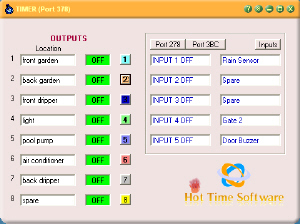 Timing software for home automation, to control irrigation, hydroponics, lights etc. Timer v5.1.0.1 is the basic version suitable for most domestic users. This is a program that enables the PC to connect to the outside world, by using the printer port LPT1. For domestic, commercial or industrial use. Win XP, NT, 2000, Win 7, 8 & 10. Same as Timer program with additional pulse timer in seconds on each output form. Has also Master control on Main form. Access to port 378 or LPT1 only. For commercial or industrial use. Designed for irrigation and hydroponics although can be used for any application. Same as Timer program with additional pulse timer in minutes on each output form. Has also Master control on Main form. Access to port 378 or LPT1 only. For commercial or industrial use. Designed for irrigation and hydroponics although can be used for any application. Same as Timer program with additional pulse timer in minutes on each output form. Has also Master control on Main form. All outputs (channels) can have up to 10 switching times. Access to port 378 or LPT1 only. For commercial or industrial use. Designed especially for school bell, lunch break or factory bell system software. Can be used in any application of controlling devices. Same as the above program but of a higher class, that controls 3 parallel ports at the same time. Suitable for domestic, commercial or industrial use. Can control with parallel port PCI-bus cards from places like ByteRunner or a normal parallel and printer port. Also can be used for any application of controlling devices. For any serious application that needs reliability of straight through pin to pin cables or port to relay, instead of serial communication software and hardware. Win XP, NT, 2000, Win 7, 8 & 10. Use Serial timer to easily communicate with external appliances on an RS232 connection. Serial timer has powerful features similar to the timer software that Work with all types of serial ports, including USB adaptors, Wireless Device Servers or any virtual port. This program is especially made to communicate with the k108, 108, CK1610 and k108 multi drop relay boards via serial connection. Similar to the above program that can communicate with external devices on an USB connection. Suitable for domestic, commercial or industrial use. Serial Timer USB has powerful features similar to the timer software that work with all types of serial and USB ports, including USB adaptors, Wireless Device Servers or any virtual port. This program is especially made to communicate with the Arduino or Pencom USB relay boards, or the k108, 108, CK1610 and k108 multi drop relay boards via serial connection.